Have you ever caught yourself losing in a polish that was so beautiful, like a drug that you couldn’t peel yourself away from? I found my soul leaping, jumping and flying through the constellations up in the night sky with Different Dimension Drops of Jupiter on my nails. 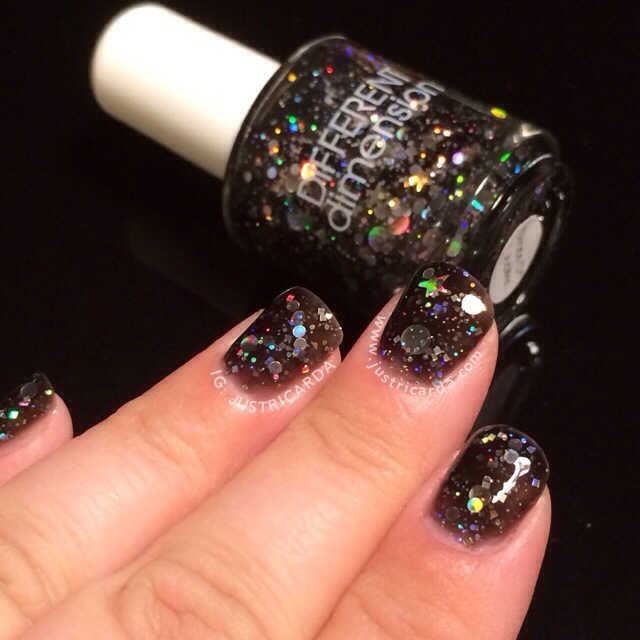 Drops of Jupiter is a black jelly filled to the brim with all these holo silver glitters in all shapes and sizes. It swept me off my feet and has gotten me all euphoric. 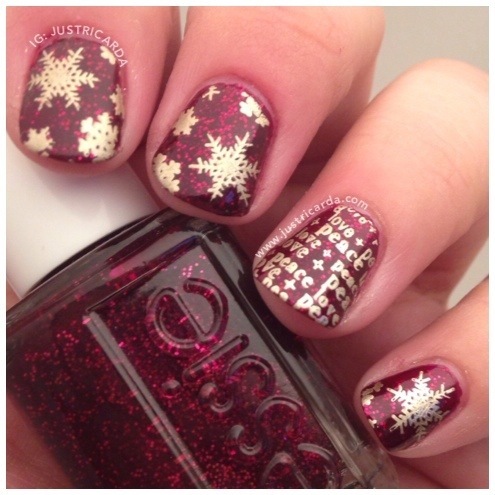 Here’s three coats of Drops of Jupiter on. Now that Thanksgiving is over, I’m looking forward to the month of December and the snow it brings us here! 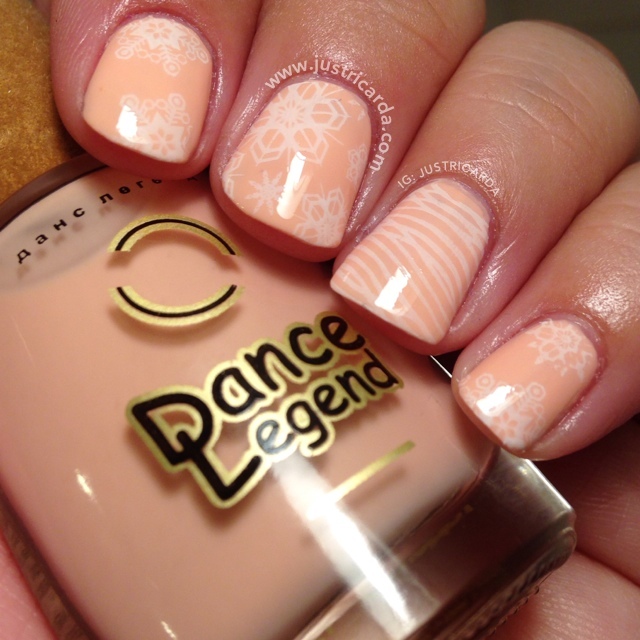 Angel’s Touch is a soft salmon pink creme from Dance Legend’s Touch Me collection. I recently was sent this by a nail mail friend who resides in Russia. Dance Legend is a Russian brand in case if anyone was wondering. Here’s my finished nails using Angel’s Touch, Sinful Colors Snow Me White and various stamping plates by Bundle Monster. Let’s talk about application. It took three thin coats to even out the small patchy spots that were not fixed by the second coat. Formula is good despite needing three coats. I personally think this color is worth the extra coat. I stamped the snowflakes and the lines using three different Bundle Monster plates. They are, BM-209, BM-319 and BM-323. Snow Me White by Sinful Colors is one of my favorite whites to stamp with because it’s so cheap and works amazing with stamping plates! If you haven’t used it for stamping, please do try! Sinful Colors can be found in chain drugstores like CVS, Walgreens, et cetera. This Thursday, November 28th is the only time in our lifetimes is when the first day of Hanukkah falls on the same day as Thanksgiving. This overlap between these two holidays won’t happen again for another 70,000 years. What do you think this Jewish nail polish addict wanted to do besides to eat my momma’s yummy potato latkes? 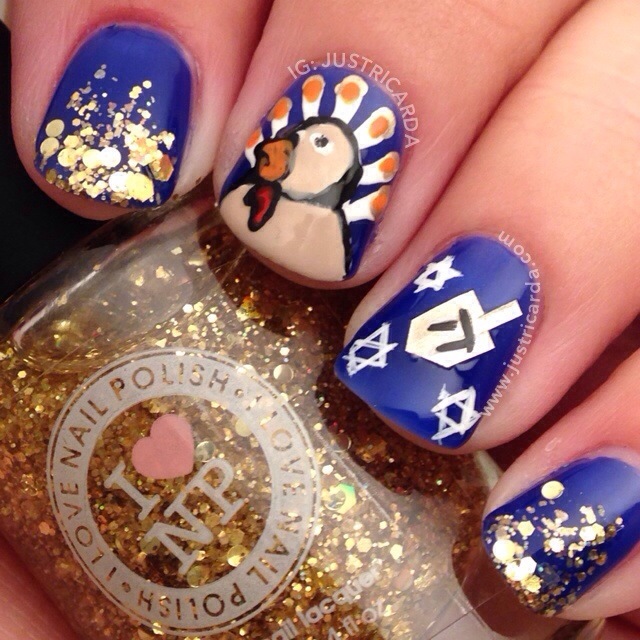 Thanksgiving + Hanukkah = Thanksgivingukkah nails. You know it! I decided to try out Essie’s Toggle To The Top from their newest winter collection that’s called Shearling Darling. I love the whole “snowflakes / let there be peace and love on earth” finished look after stamping Essie’s Good As Gold on top of this new polish. Let’s talk about this new polish I got. 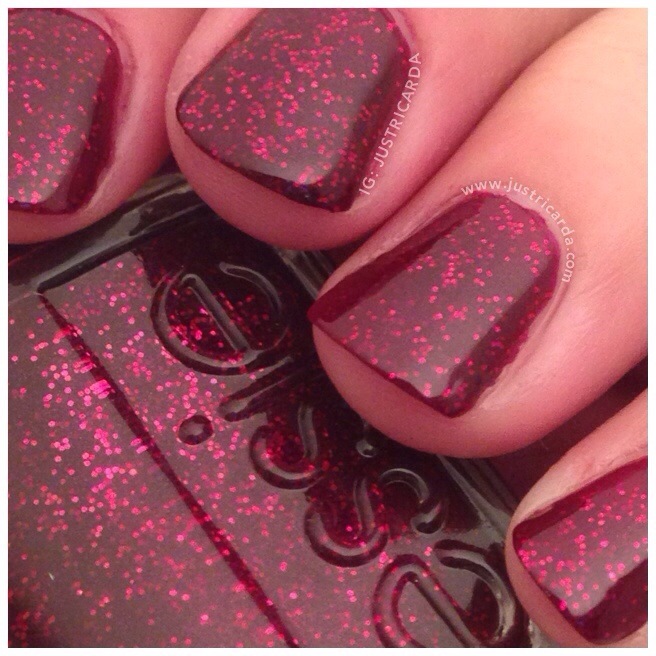 Toggle To The Top is a very dark vampy red jelly filled with these sparkly red glitters. It’s very gritty and I found applying very thin coats to be helpful in making it easier to work with. It is my understanding that there’s been some complaints about it being very lumpy and/or chunky and that it is very difficult to apply. This is two coats of Toggle To The Top with one coat of my Glossy Glam topcoat. It’s really pretty! It reminds me Leading Lady from their last year collection. Here’s a bottle/swatch comparison between the two. Leading Lady is on the left and Toggle To The Top is on the right. As you can see, Toggle To The Top is a little darker. Here’s swatches to show the difference. Both colors have two coats on the swatch sticks. 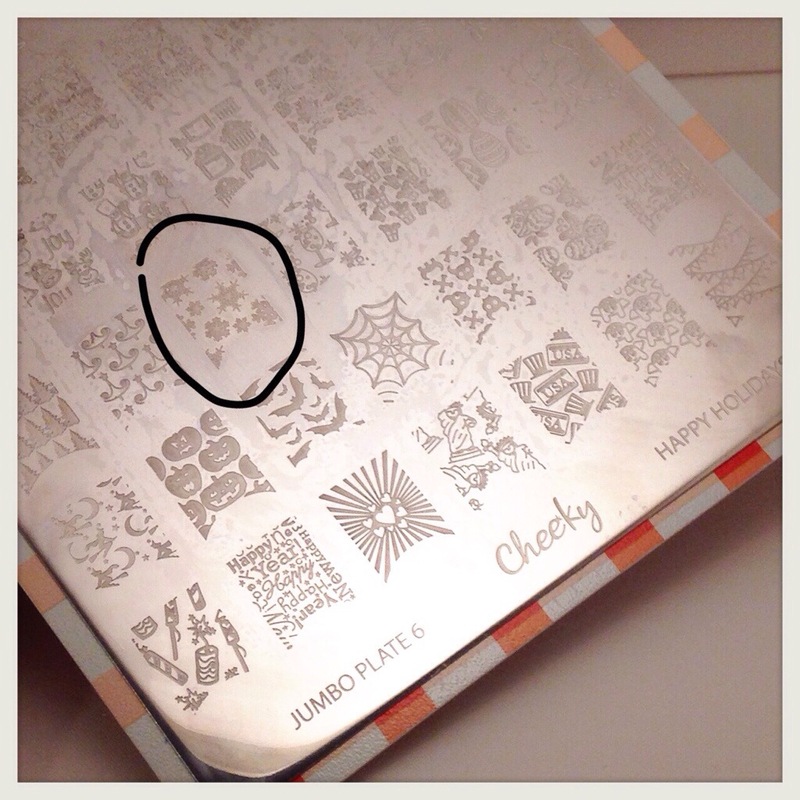 I used the snowflakes design on the Cheeky’s Jumbo Plate 6. The plate is called Happy Holidays. 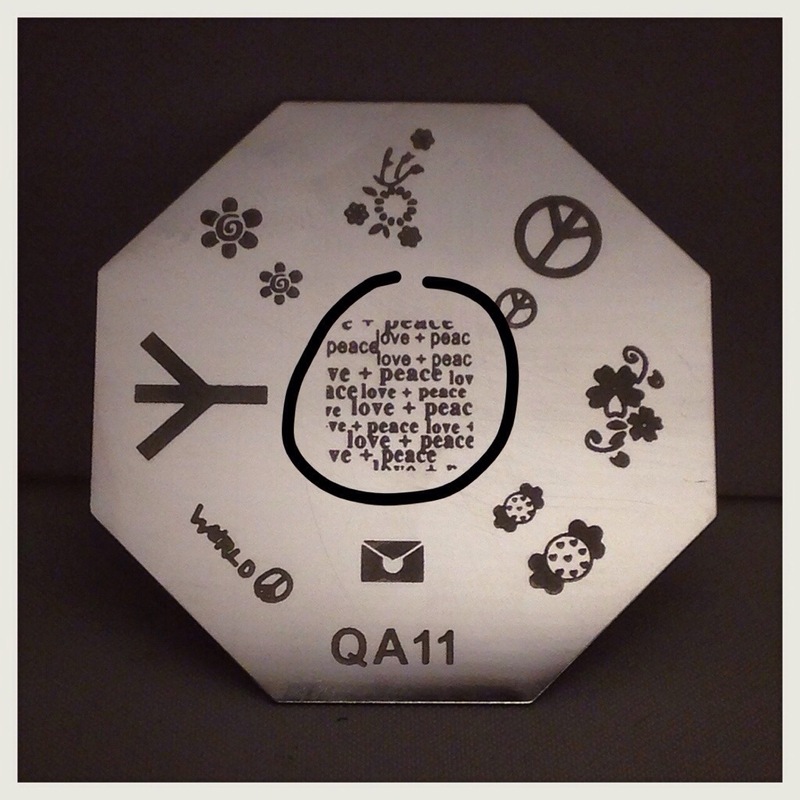 Love + Peace is from a Fauxnaud (Konad knock-offs) with QA11 on it. Close up of the crab because I love it that much! All fingernails except for the ring finger have been painted with OPI’s OPI’s Kiss Me at Midnight (liquid sand) and stamped with OPI’s Alpine Snow. 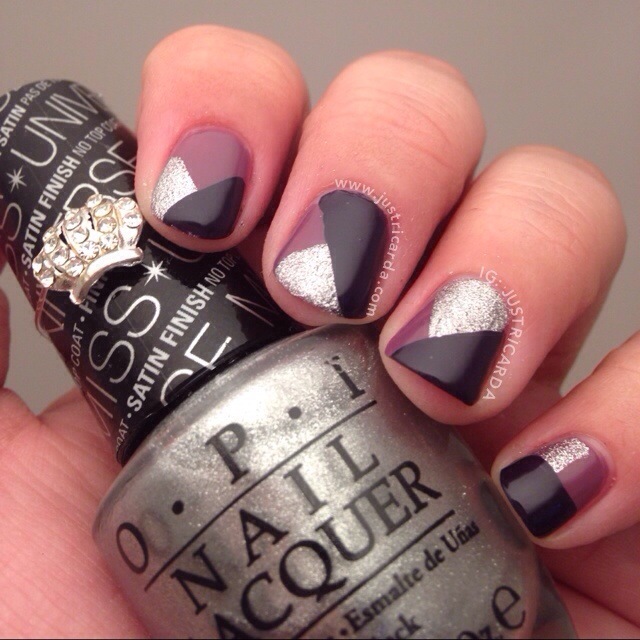 Ring: OPI’s Ski Slope Sweetie. Stamped with Essie’s Good As Gold using Cheeky Jump Plate 2 Tropical Holiday plate for the wavy lines. 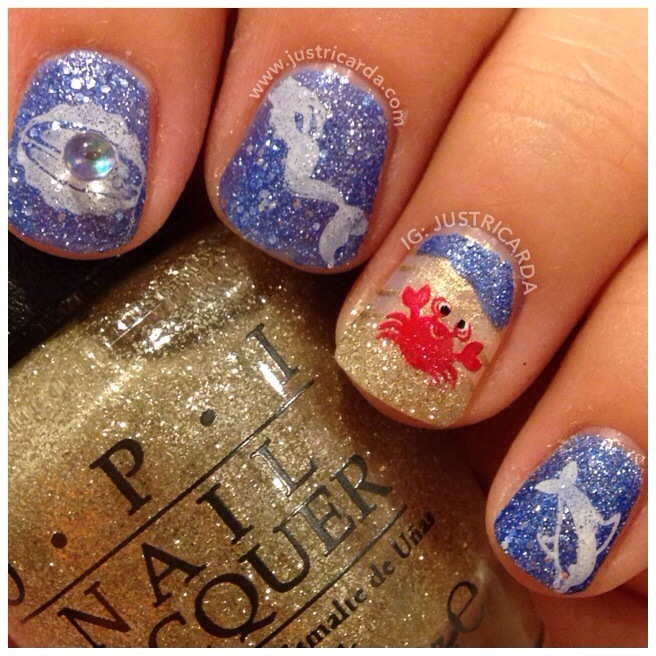 Painted OPI’s My Favorite Ornament on the tips to make “sand” for the crab. 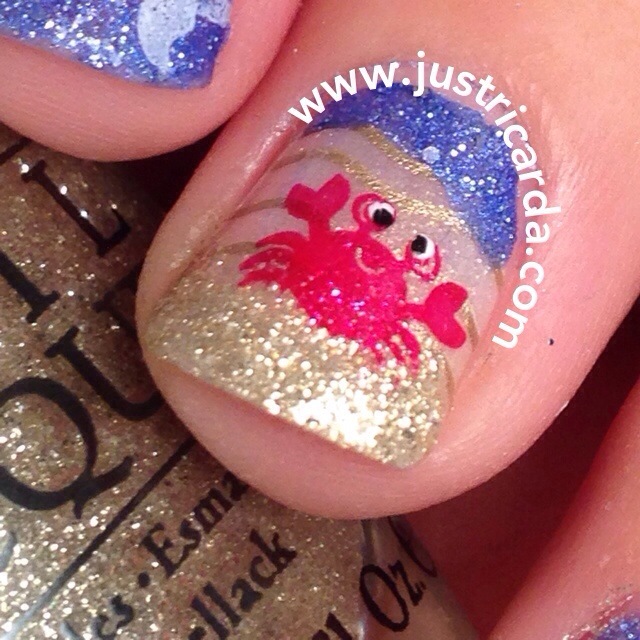 Stamped the crab with OPI’s The Thrill of Brazil using the Winstonia W106 plate. 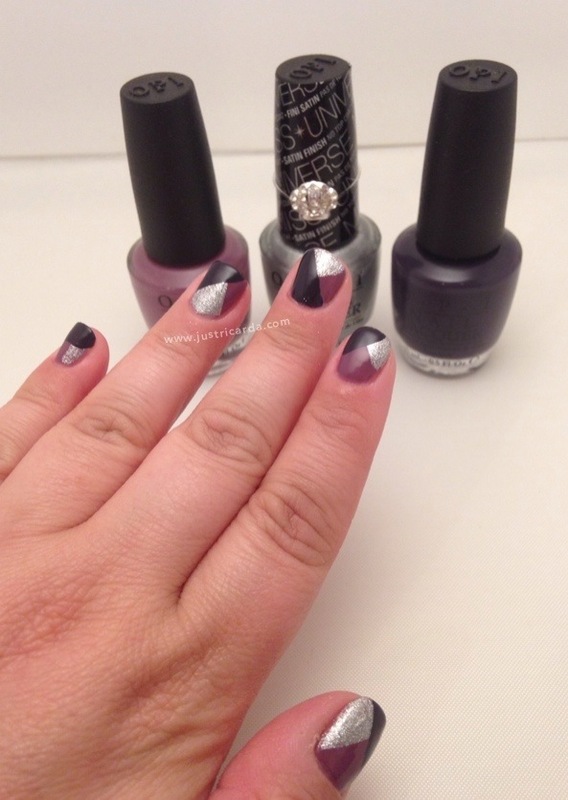 Painted OPI’s Kiss Me at Midnight near cuticles. I used a couple of things but most importantly the Nailz Craze’s stamping plate NC05 for this manicure. Two of Skin Food polishes. I apologize for not knowing the color names. They’re written in Korean. First, I painted my nails with OPI Don’t Burst My Bubble. 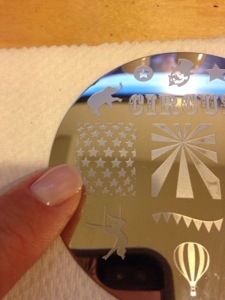 I got my chosen polishes for the stamping plate ready. 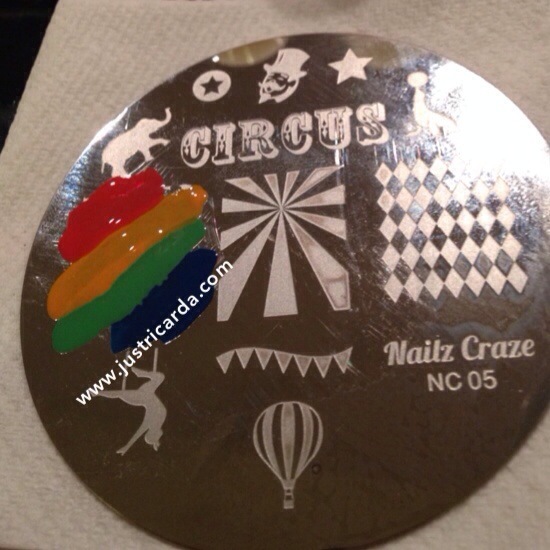 Here’s the stamping plate I used by Nailz Craze. I’m pointing at the full multi stars print. This is what I used on my ring fingernail. 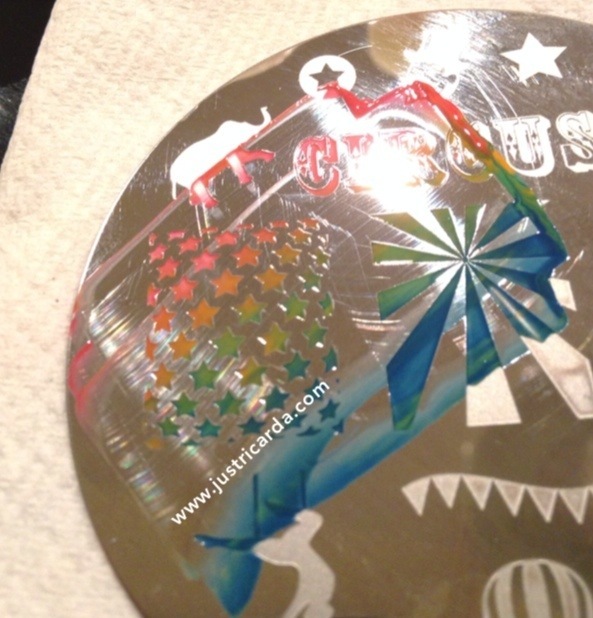 This is how I set the plate up for gradient stamping. I painted a generous amount of various colors on top of the chosen design. You could do lines or blobs all over the place. You will need to work quickly before the polished lines sets in. Take your scraper and scrape in one direction. The excess polish will go on the scraper. Go back to the beginning and use the excess portion that’s on your scraper… and scrape one to two times so it overlaps to create this gradient look. 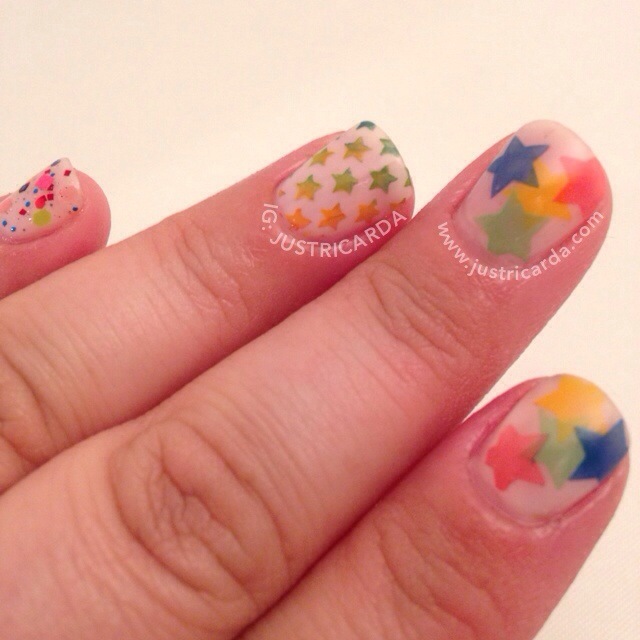 I picked up the gradient stars with a stamper and stamped it on my nail. 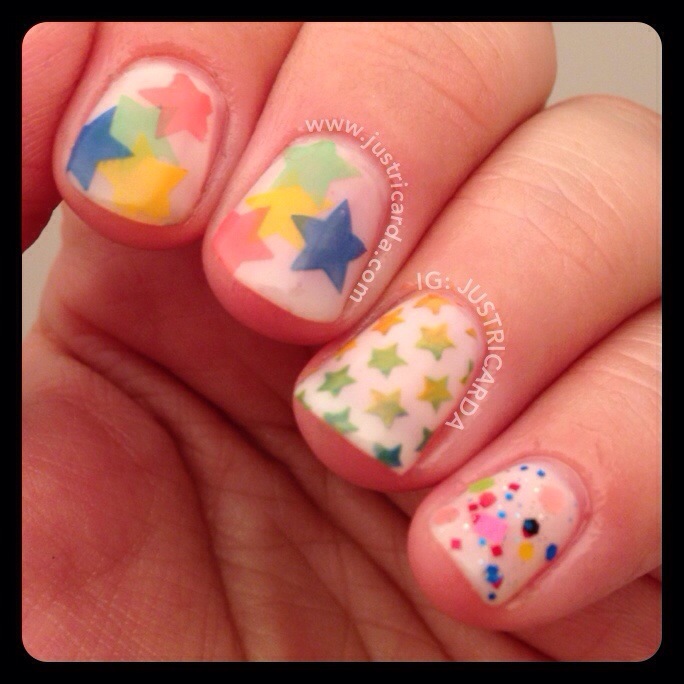 I also went ahead and did the individual stars on other nails. I stamped a star and topped it off with the Glossy Glam topcoat, then I would stamp another star on top and repeat the process until I was happy with the results. I painted Dr. Franken by Polish addict on my pinky and thumbnails. I hope this manicure inspires you to do some gradient stamping! 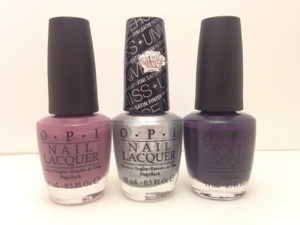 I love this new trio by OPI! It’s the Miss Universe 2013 collection. The colors in this collection are: I’m Feeling Sashy, This Gown Needs A Crown & Miss You-niverse. Since it was a trio, I knew I had to use all three for some color blocking nails! Color blocking nails was a breeze to do! I’m heads over heels for these three colors. On the left is I’m Feeling Sashy. It is a dusty medium purple creme. Perfect two coater. Formula was great and I’m a sucker for purples! In the middle is This Gown Needs A Crown. Holy polish! This is the best silver glittery foil I ever tried in my life. I only had to do two very thin coats for full opacity. Everyone needs This Gown Needs A Crown in their collection. It comes with a cute crown charm and I think it’s perfect because it’s truly the jewel of this delightful trio! This applied absolutely flawless and dried to a smooth finish. 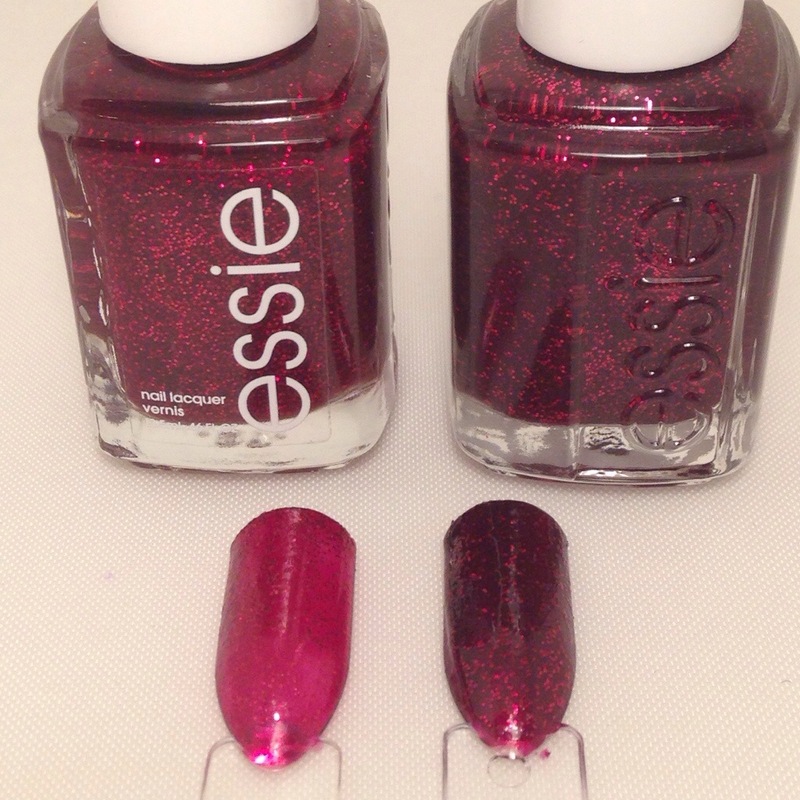 On the right is Miss You-niverse and it’s a dark plum creme. The formula couldn’t be any better. One coat was enough for full opacity. I used only one coat of Miss You-niverse in my color blocking nails. Here’s another picture of my color blocking nails with this trio. Would I recommend this collection? Yes. I give this collection 5 out of 5 stars. I have a feeling that I will need to get a back up of This Gown Needs A Crown. Overall, I’m very happy and excited about this collection.